For many campers, a campsite with a water park is a deciding factor when choosing their destination! Many campsites in Brittany have a water park where you can enjoy hours of fun in the water. But how do you choose? Here are some tips to help you make the right choice. A campsite with a waterpark is good.... with a heated indoor swimming pool, it's even better! A covered water park is at the top of the list when looking for campsite in Brittany. And as we often don't want to wait until the summer to take to the water, the choice of a campsite with a heated indoor swimming pool is a matter of course! It is a guarantee that you will be able enjoy the pool throughout the season, from the opening in the spring to when it closes in the autumn. Another advantage: you are no longer dependent on the weather! So, if you are planning to spend an afternoon at the beach, but a little rain comes to spoil the fun (it can happen from time to time in Brittany), a campsite with a covered and heated pool complex is the ideal alternative to the ocean. We see more and more spectacular pool complexes popping up in Brittany's campsites, offering top-of-the-range infrastructures worthy of a holiday resort. 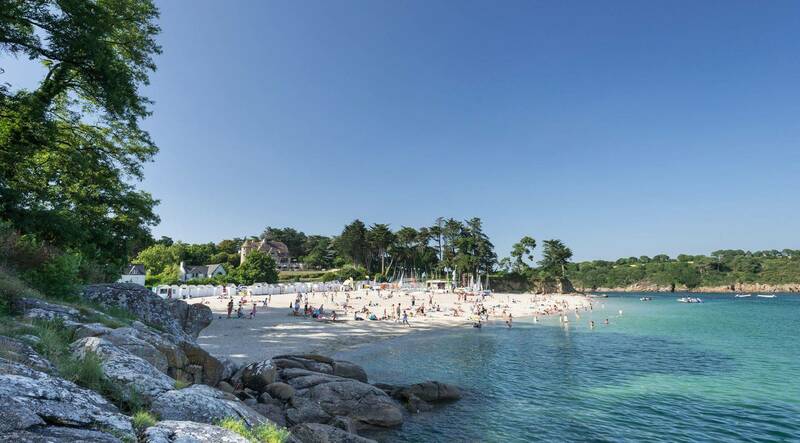 A large number of campsites with water parks in Brittany also offer a wellness area with a spa and whirlpool, sauna, jacuzzi, swan neck waterfalls, massage jets... so you can enjoy a leisurely swim and relax during your stay in Brittany! What better way to spend your time during your holiday on a campsite in Brittany than at an aquagym, aquabike, aquajogging, aquastep session or a water polo match? The vast majority of our 4 and 5 star campsites in Brittany offer you a fun, stimulating programme to help keep you in shape during your holiday. You can combine the benefits of a swimming pool with a sports activity! Swimming supervised by a qualified lifeguard: it is not compulsory, but it is better, because it is safer which means peace of mind for parents! The most beautiful water parks in Brittany are at CAMPING PLUS! Now that you know a little more about the things you need to consider, all you have to do is find your camping destination with a water park in Brittany: Finistère, Côtes-d'Armor, Morbihan, Ille-et-Vilaine or Loire Atlantique... the hardest thing is to choose! You already know where you want to go but haven't yet decided on a particular campsite? Feel free to take a look at our campsites in Brittany with some of the best water parks in western France!